I’ve been contemplating on financial integrity lately, especially in the way churches use their money to celebrate different milestones. I see a lot of funding misdirected. One area of misdirected fund is anniversary celebrations for almost ALL Christian organizations. It’s almost out of control. I remember one time when I suggested to a certain organization that perhaps the best way to celebrate the anniversary is to do what Jesus said to do, invite all the poor and the oppressed to eat instead of throwing another food-wasting extravagant banquet. Someone told me that I just didn’t get it. SADLY, I DO GET IT. I exegete the Bible and write about it for a living. Look at the above passage from what Jesus said in Luke. What is so difficult about the plain meaning of Jesus’ teaching? It isn’t a metaphor. He really meant it. I suspect our problem isn’t money. Our problem is priority. The above teaching shows that the way we use money should be above a mere transaction. Is Jesus against banqueting? Of course not. He’s often seen eating with both the privileged and the underprivileged. Jesus was talking about priorities. Jesus was demanding that our priorities shouldn’t always be based on the idea of transaction of visible gains. I emphasize “visible” because Jesus did use a lot of transaction and stewardship metaphors to describe the often invisible benefits of the kingdom. The visible benefits are almost immediate as they come in real repayment (see Luke 14.12). It’s all about what “I” can get out of it “now”. The “I” and “now” aren’t what the kingdom is all about. That’s what Jesus was saying. The church ministry is never just about the money. Neither is the church budget. It’s about priorities. IF Jesus’ saying “where your feature is, there your heart will be also” is true, the souls of many churches and Christian organizations are already dead. We have now come to the story of the rich man and Lazarus story in chapter nine in Levine’s Short Stories by Jesus. This chapter is one of Levine’s best chapters. She first talks about the tension of whether or not to read eschatology into the parable. She leans on the side of reading the parable both eschatologically and economically. I agree with Levine that the parable IS about economy as well as eschatology, though the detail of sitting at the side of Abraham was probably symbolic of being a friend or child of Abraham. Was the rich man moral or immoral? Was he deserving of being sent down to eternal punishment? These are the questions Levine attempts to answer. In agreement with her, I would say that the man was immoral in his failure to give to the poor man. His privileged position allowed him to order Lazarus around to be sent back to his family even in the afterlife. Obviously, this is a hypothetical situation to illustrate his callousness. Was he deserving to be sent to eternal punishment? Of course, that’s why the parable has him down there. This may not sit well with our theological sensibilities but Jesus isn’t about fitting our grid. One important observation she makes is about indifference. The rich man didn’t hate Lazarus. He just didn’t pay attention enough to even muster up sympathy. That is the real tragedy. While the Bible SEEMS to be against riches, at the end, this parable seems to indicate that the Bible is against apathy. Those who love money like the Pharisees who sneered at Jesus in Luke 16.14, had to be apathetic to the wealth all around in order to love money that much. This week, I continue to continue my series on evangelical Bible abuse. I’ve decided to take a little break from talking about HK to complete this series. I’ve read a popular and famous American systematic theologian (I loosely apply that term to him because many consider him one) on his take on politics and the Bible. I’m going to deal with one issue he talks about in order to illustrate how tough it is to use the Bible to support your own agenda while opposing agenda of others. To start with, I have a very simple question to ask. What if the Bible does not support my agenda? This author’s answer is simple. He can simply put in bold print “We have a very different situation today.” Now in principle, that is a good thing to do not with verses that do not agree with our conviction but to do that with every verse in the Bible. First we should examine the meaning of one verse he quotes. I would work with a few more verses simply because they often are read within the same corpus by Christians as part of the first books of the Bible, but I”m limited by space here. Ex. 23.9 is a repeated idea from the injunction at Ex. 22.20. The contexts of two similar injunctions are different in that Ex. 22 talks about the individual Israelite while Ex. 23 talks about those who were judges over Israel. Thus, the different context shows the universality of this injunction both at the individual level and the judicial level. This injunction is about as absolute as they come within the Torah. Ex. 23.6-8 talk about bribes and lies and Ex. 23.10-11 talk about the needy. Thus, the injunction has the same weightiness as bearing false witnesses and oppressing the needy. This is not something we can just shrug off as being “for them.” The historical situation tells us that Israel had always had needy people, some Hebrew and some foreigners. This ongoing historical situation doesn’t just apply to the Exodus but ran all the way to the exile period. The major difference however is that the political system of that time was different than today. As we have already seen, the situations are indeed very different today than those days. Those days, the Bible had theocracy. Even within theocracy however, the determining factor for theocracy is whether the alien was willing to live within the covenant religion of Israel. Due to the fact that religion was part of Israel’s law, it was a requirement. Is our law based on a covenant religion? Even without the covenant religion of the ancient Israel, we can at least draw the conclusion that helping the foreigner ranks right up there with being truthful (which we surely can’t make situational) or helping the needy (which most of us can’t make situation with a clear conscience). The tension then is between what was particular and what was universal. Since this theologian speaks against any kind of help for illegal immigrants, he uses the least amount of scripture to support whatever cause he wants mainly because scripture does not support much of what he is saying. He tries to cite scholarly studies that support the closing of border in Israel’s history to prove that border was indeed God’s will. The trouble with that is whether anything from Israel’s politics back then could be applicable to today’s America. If he sincerely believes that we have a very different situation today (and he is right), why would he cite the border situation back from ancient Israel? The fact of border in Israel was due to the importance of keeping the Israelites together due to their ideally homogeneous faith. We have no such situation today in our multi-faith and pluralistic society (unless he still insists that we’re a Christian nation, which he seems to also insist and that we’re still a homogeneous society). The theologian’s logic goes further off track when he insists that closing the border and insisting simulation is the perfect solution. Without a doubt, as an American, I believe we have to deport escaped criminals but we do that with all the other countries anyway. I understand some of my readers are going to object to what I say as naïve liberal nonsense, but from a moral point of view, the whole idea of closing border is problematic to US history. At one point, American land belonged to the Native Americans. Imagine if the Native Americans decided that it was a bad idea to help the colonists in Virginia Colony as well as the Plymouth Colony survive and just let them starve to death. Imagine worse. Imagine if they decided to “close the border” and just kill all white men as trespassers. IF they had a closed-border policy, America wouldn’t be what it is now. The original spirit of this nation versus the spirit represented by this theologian is at variance. No matter how he justifies himself, his stance is basically historically illogical. The immigration situation in the US today is less than best, but his solution is simply untenable from an ethical and biblical point of view. Some of his other steps are probably helpful in terms of practical application: teaching children to learn English to help assimilate, helping illegal immigrants to gain legal status, a compassionate path to move from illegal to legal immigration. These are all practical steps, but some of his other steps simply cannot be ethically and historically sound even if they work (and I doubt that they do). At the same time, there’re issues that these verses do not deal with either. The greater idea of justice needs to be dealt with as well. For example, when funding goes to helping illegal immigrants, many of our shrinking middle class are feeling the impact of cut government spending to help the locals that are in need. People like injured veterans and honest citizens who hold several jobs to make ends meet will have great need as well. How about the funding to schools that are underprivileged even if those who are affected are honest citizens working their hardest to make ends meet. In all this, where would the discussion about greedy rich who are cheating the system? True justice is fluid, nuanced, prioritized and even gradated. These and many other topics are all justice issues that can’t be solved simply by appealing to the text that seems to support us while distancing ourselves from texts that do not support us and shout, “We simply have a different situation today.” No, ALL biblical situations are different, not just the select few. If you appeal to history, you can’t have your historical cake and eat it too. As I said before, the problem is not the biblical text. The problem is the interpreter. A heart-breaking story in “prosperous” HK surfaced this week. It details the routine of an old lady who is nearly 80. She lives in low income housing and her only means of paying her rent was to pick up cardboard boxes dawn to dusk. In this “prosperous” and “relatively just” city, 70% of the elderly do what this lady does to make ends meet. This is the city where the chief executive freely admits that democracy would allow the poor to dominate, indicating that the poor occupies a substantial part of the population. I use words of prosperity and justice to describe HK because those have been the words used by many of the upper middle class church leaders there. In contrast, Jesus told a parable in Luke 14.15-24. Since I’m writing the Luke commentary in Chinese, I’m going to share my reflection in this blog. Let’s see what Jesus had to say about prosperity and the kingdom. Someone told Jesus in a banquet that those who would eat at the messianic banquet were the blessed/happy ones. Jesus told a parable in reply. He talked about a rich host opening a banquet and the host invited all the usual rich people. However, everyone unexpectedly made excuse not to go in Luke 14.18-20. The excuses ranged from having bought a field to having bought some animals to having gotten married. The order of field, oxen and marriage is interesting in that the excuses moved from financial to marital. The buying of field came from the upper class of Jesus’ day. The buying of oxen was due to the need to plow a large plot of land. While the ones about purchase indicate wealth, marriage seems more basic. The excuses then would seem more and more reasonable, but yet, it seems like none of excuses made here were reasonable. Why in fact would a new marriage prevented one from attending the banquet? This parable then is the mockery against those who made excuses. It is important to note that the two analogies about the field and oxen put the emphasis on wealth because of the setting of the real banquet Jesus was eating. Such banquets were the occasion one shows off his wealth and high society connections. All the excuses were of the same kind: they had other more important priorities. Wealth played a prominent role because Jesus was sitting among the rich. The host then sent his slave to invite more to come in the parable. The places where the slave went in Luke 14.21 were probably where the outsiders hung out because what the slaves found were the down and out people. These underprivileged people would be a stark contrast with the first two excuse makers. The ability to buy a field and five oxen shows that they were men of some wealth but they didn’t go to the banquet. The Pharisee who hosted could certainly relate to this degree of wealth. The poor would be the last invited and they became more like those who were first invited, much like what Luke 13.29 says. This strange guest list is the same list Jesus used in Luke 14.13. Still there was room. So, the master told his slave to get people from all over to come in Luke 14.23. When Jesus taught this story, he taught it to the wealthy. This story seems like a story about the future when the kingdom would be released or is it? I propose that the Jesus’ banquet setting in which he told the story suggests otherwise. It is about the present! It is a story to the faith community and its leader, the host of Jesus’ banquet, the Pharisee, that true faith community would have unexpectedly blessed people like those who were invited last in the messianic banquet. It is not just or even morally sound to not notice the social ills and the poor in any faith community. The story was also written to Theophilus who was a Roman official. He would be a patron to Luke and the church. He too would hold banquets. Would his banquet include those outside of his privileged circle? When reading this story, if HK upper class church leaders and rich Christian politicians who pronounce “peace, peace” when the chief executive clearly stated this week that those who made low income had less rights, then pages of Luke 14 need to be torn out of their lectionaries and their Bibles because that would be the only way we can say that the HK society is “prosperous” and “just”. Jesus wouldn’t have said the same thing. True prosperity is to allow the earthly faith community to reflect the value system of the messianic banquet. Anyone denouncing the effort to fight for the (democratic) rights of the poor is immoral and anti-Christian. Instead of all the popular cheap unity many Christian leaders are calling for right now in HK, I propose that we don’t unite with such false gospel preachers. Instead, we need to call leaders into account for supporting the system and the (Christian) politicians. This is no time for cheap unity. This is the time for a clear division for the blatantly right and wrong value systems. Think about that! I’m blogging about chapter 12 of my book today. This ranks among the commonest abused passage of ALL TIME. This passage is the favorite passage when preachers want to preach about giving to the church or the poor being generous (thus guilt-tripping us all into giving since we’re soooooo rich). The popular interpretation goes something like this. Jesus compared the poor widow’s giving to that of the rich. Jesus commended her (so it seems) for her generosity because giving, after all, is about percentage. See? Have you not heard this before? If you’re looking for a good guilt trip for your stingy congregation, I’ve just constructed your Sunday sermon for you. The problem is, this is the WRONG interpretation. If you think this is the right interpretation, you need to think a lot harder. If you wish to use this as your giving sermon, don’t! Jesus could be saying the very opposite. I believe Jesus’ message is really this: don’t give to a temple that is about to fall. The poor widow did so generously and wastefully. There are some presuppositions that lead to the erroneous traditional interpretation. First, some presuppose that Jesus’ comments were complimentary when, in fact, Jesus was merely making an observation about the percentage of her giving without saying, “Go and do likewise, my disciples.” Second, and this is a more insidious presupposition, some insist that one can isolate Luke 21.1-4 apart from what precedes and what follows. We must notice that the disciples didn’t respond by saying, “Lord, teach us to give more.” Instead, they pointed out the temple building to which Jesus also referred in the previous passages. If the disciples got a different response than what WE expect in our modern day interpretation, we should be quite alert to why they’re talking about the temple still. What is the key to finding the answer? This is the lesson for my readers. You need to look at the context before and after in Luke in order to determine whether this is about giving. There is exactly NOTHING in the context before and after about giving. Everything surrounding the story, IN THE SAME OCCASION, talks about the temple! Why would Jesus all of a sudden teach about giving? Thereafter, the teaching continues about the temple destruction. This is why I insist that I’m correct to read this “giving” story in the light of the temple. We can’t isolate the story because Jesus had not finished teaching and the entire content of his teaching is about the temple. If you insist on preaching about giving with this passage, knock yourself out. Just don’t say that your preaching is biblical. I now blog on chapter seven of my book. When I first started reading the Bible seriously, Luke 6.20 bothered me. At first, I tried to harmonize with Matthew 5.3 by saying that Luke really meant for the poverty to mean a kind of spiritual hunger. After I studied the Bible for a while in a more critical way, I came to the conclusion that perhaps Matthew and Luke both drew from the same source and Matthew added to the source “in spirit,” making Luke’s invention more original than Matthew’s. Still, even if Luke’s invention of this entire discourse was trying to play to his own ideological bend, how can being impoverished be a blessing? In my book, I try to take Luke’s formulaic saying and lok at it from evidence from perspective both internal and external from the text. The external place we can look for answers should be in extra-biblical history. The best source is probably Josephus. When we read Jesus’ statement about material wealth, we often read our view of material wealth into our interpretation. In that society, people viewed wealth to be one form of God’s blessing. Within the area where Jesus ministered, the majority was very poor. There was no middle class. The best way to gain wealth was to acquire land and have someone else farm it. It would serve us well to see how acquisition of land took place by our reading of authors such as Josephus. In such a society (somewhat unlike ours), poverty and wealth could have moral implication. There is danger in reading Luke 6.20 straight. Some might see that Jesus exclusively ministered to the poor, making our ministry to be entirely focused for the poor. By doing so, we deny the universal scope of the kingdom. Others may think that being poor and not working ahead is fine because we already are given God’s wealthy kingdom. This also plays havoc into that stereotypical image of Protestants being uneducated lower class losers who only quote the Bible and know nothing else. Interpretation has its own consequences. In light of the increasingly serious homeless situation in Hong Kong and even here in the US, I want to take a little break from blogging about my book and talk about my own dealings with the homeless. I borrowed the above picture from a friend’s Facebook wall. I wish I knew the original creator because it does ask a profound religious question beyond doing some good for a fellow human being. Back in Hong Kong, I used to teach a course at the densest square mile on earth (aka Mong Kok area) on a weeknight in a city-center area. When I go to this urban center to teach my course, I always come out of the subway exit where the same crippled gentleman would prostrate himself with his bowl begging for money. The picture always breaks my heart. As a rule, I try to have proper change ready to give to this man. Some days, I was a little short on change (people do not ride the subway with change in HK; they use the Octopus card). Some other days, I had bills that are way too large. On those days, I just didn’t feel like giving to the poor. After all, I had to feed my family! Now, as a Christian with the heart for the poor, I felt a bit guilty on those days that I failed to give. Soon, I would try my best to have the right change whenever I went to that busy city center so that I could give. This however creates another problem. How much is enough to help the poor person? I know what people are thinking. Some are saying, “Maybe this person is on drugs.” Perhaps. 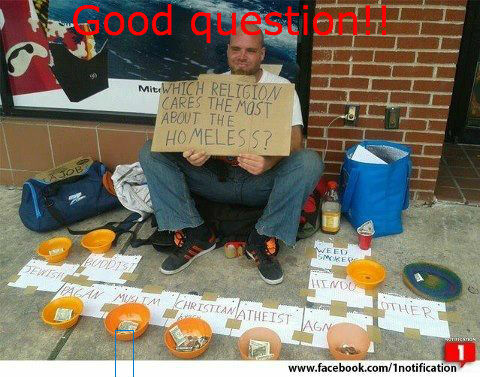 Others say, “Well, why not give him a large sum instead of a set of spare change?” I admit that I have no answer. Does my family also deserve my hard-earned cash? Why can’t this person go to a homeless shelter? The questions are endless. I admit I still struggle over the amount to give. Now that I earn a lot less because of my freelancing work (instead of my former institutional salary), I have a lot more excuses. Finance can be really tight sometimes, but surely, I still live a lot better than the majority world. I have come to the conclusion that we simply can’t solve the poverty problem, and we can’t ever get the amount right. However, this does not mean we just give up. What I’ve learned with the subway giving in HK is that preparedness and intention are both important. Sometimes, Christians mistake the teachings of Matthew 6.1-4 to be equal to having no plan to give alms. Just because we do not necessarily make a public showing of alms-giving, it doesn’t mean we do not prepare. In fact, being unprepared is the biggest excuse I can give myself, “I don’t have the exact change. The amount I have is too large. I have no cash.” The excuses can be a mile long. I find myself identifying more with the poor when I actually have them on my mind when I get ready to head out to work with the right amount. I find myself trying to make sure I have enough to give. To me, this is what it means to identify with the poor. We have to have them in mind before we can contribute to the solution rather than ignoring the problem. Problems are manifold! I’ve also heard the appalling story that some beggars in HK are from mainland China where they were deliberately amputated since childhood (many were kidnapped) by the underworld to beg for money. In other words, these are beggar gangs controlled by the Chinese mafia. The money goes back to the mafia baddies. I totally understand that. However, would withholding the alms be a better option? Is such cynicism even part of the Judeo-Christian wisdom tradition (e.g. Proverbs)? Would I know which one is in real need and which one is not? No! That is the catch. I’d rather err on the side of generosity than cruelty. I believe the biblical spirit also errs on the side of generosity. I don’t want to judge the person in need. Who knows what his life story is? Who am I to judge that story? God has given me something that I can use to bless others. That is what I know. What am I saying? Certainly, generosity is not without tension, but intention is more important than the tension. I know of a group of young people in Hong Kong that intentionally gather together to help the poor in the best way they can. I’m friends with many of them. They too have careers and jobs; they too are busy, but they gather with intention and preparedness on many occasions to give money and spend time with the poor in the name of the gospel. I think both intention and preparedness are more important than tension and judgmental speculation. Sow as you go! Live generously! Be kind! More importantly, be prepared. Who knows how God would bless someone because of what we’ve done? This is an open letter to my evangelical mission-minded western friends (well, I too am an American citizen, Asian American) in the guise of a blog post. 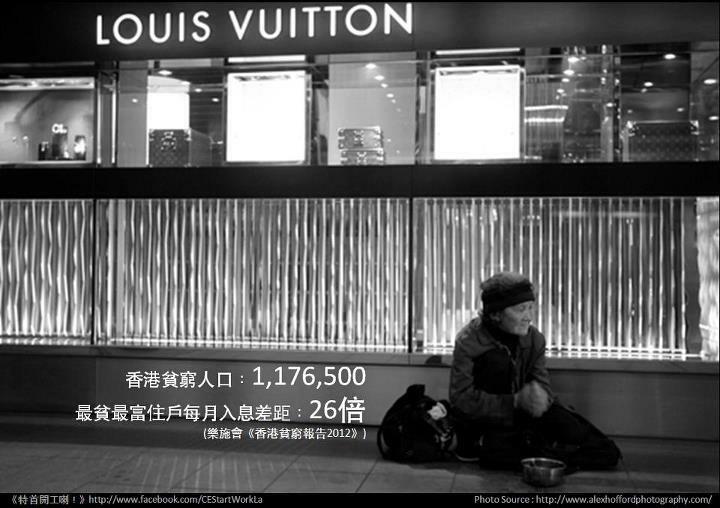 According to the above caption in Chinese, Hong Kong has the great contrast of the rich being twenty six times richer than the poor. Twenty six!! Not six, not twenty, but twenty six! This week marks one of the biggest strikes in recent times on a labor dispute for the docks of Hong Kong. As one of the most prosperous free port of the world (ranked number three behind Singapore and Shanghai), Hong Kong corporations have been raking in the bucks since day one. Yet, the pay of the dock workers actually have decreased since 1997 handover to China. In other words, the rich is getting much richer and the poor is getting much poorer. The rich however is getting rich off the poor’s misfortune. The daily working hours of these workers are so high (twelve to eighteen) that they’d be better off working for minimum wage in the US. To make matters worse, Hong Kong, by and large is probably more expensive than ANY US city. Do we have a gospel for these people? One newly planted expat church from a US mega-church thinks it has the answer. It conducts a seminar on why happiness is not enough but true joy in Christ is better. Well, I suppose there’s nothing wrong with this topic. In fact, as a Christian, I quite agree with the general proposition. In times like this, however, is this the best topic? It sounds to me more like a nicotine patch for a city full of chain smokers or a mirage in a desert full of thirsty people that religion is often accused of being by those who hate Christianity. Who can blame the haters? The timing of this topic about joy couldn’t be worse. No matter how many verses the speakers quote from, the message will never sound much like the gospel unless there is a true understanding of local conditions by spending quantity and quality time with the locals. Now, I cannot blame this innocent faux pas or can I? After all, why would a newly planted expat American church know anything about local conditions? Before you nod your head, you must see something wrong with the question I just asked. If not, think twice. Here’s a little missiological lesson for my western friends. Before you head into an area to do “mission” and make “converts” for God, please make sure you know what mission is and what local needs are instead of coming in with fancy topics and unfulfilled hype. We certainly don’t see St. Paul coming into Athens speaking Christianese! I know a lot of you who are a little more mission-minded will think that Hong Kong is perfect for being the gateway to reach China. Yes, I know. I heard that message for years. Once again, before you nod your missiological little head, think about what I just said. Let me translate for you. What that message really is saying are the following. First, any westerner can “use” Hong Kong to get to China. Second, the converts in China, as potentially large as they will become, are more important than local needs in Hong Kong. Let me respond. First, no one likes to be “used.” In fact, western colonial powers have “used” Hong Kong in modern China until 1997. The locals are not idiots. They know when they’re being used. Some resist; others oblige, but no one is unaware. Someone will ask me the inevitable question when we talk about reaching Chinese with the gospel, “What is the biggest obstacle in mission?” My answer? Based on real-world experience, most colonized people think that the gospel is a western religion (though it’s Jewish) used by colonial powers to exploit rather than edify. Many missionary efforts still look like religious colonialism even to believers like myself. Is this what the gospel is about? Second, if we bypass local interests and go straight towards the target China, we are essentially saying that conversion is all about numbers. Is that what the gospel is really about? Really? If you say yes, please stop reading my blog and go read the Bible, the ENTIRE Bible, again. Is there a gospel for the oppressed dock workers? Not according to the recent missionary strategy I’ve seen. These new church planters seem barely aware of the economic and political situation and if they are, they’re choosing to ignore it, all in the name of the gospel. Planting yet one more English-speaking church in Hong Kong will only reach more English-speaking mostly very successful middle-upper class, often white elites. Is there a gospel in that? Not according to my Bible! You may say, “Isn’t preaching any kind of gospel is better than none? Isn’t getting more converts always great for the church?” To such questions, here are my retorting questions. Are you sure you’re preaching the gospel? Are you sure you’re converting the true converts? Before we think any unreached people group (and Hong Kong is not unreached at all) with our gospel, we should make sure we have a gospel to preach. Otherwise, stay home! I normally blog about scripture meanings and usages, but I want to blog something special for the upcoming New Year about our Christian culture. A while back, I posted a story on Facebook about Chow Yuen Fat, the megastar from the Hong Kong movie industry who crossed over to star in Crouching Tiger, Hidden Dragon, and The King and I. The story goes something like this. Chow has vowed to follow his Buddhist faith to give away 99% of his earnings to charities. I’ve become a fan of his charity work and simple lifestyle as of late even though he’s Buddhist. What I did not expect was the Christian moralizing that went on after I posted the compliment about Chow, of how he can sometimes make us Christians ashamed of ourselves. Here’re some of the responses. 1) Chow has the media following him around and uses media to boost his image. 2) Chow is Buddhist and is trying to boost his karma in his afterlife. 3) Whatever the media report must be exaggerated. Someone check with Chow. 4) There are other Christians who have done the same but the media do not report because (shockingly) the media are biased. Such (misled) rhetoric runs along two lines of argument. First, it assumes to know Chow’s motive. Second, it blames the media for giving Chow a great image and Christians a bad one. The two lines are both nonsense. If I didn’t know better, I’d think Christians were misinterpreting the vine allegory in John 15 by bearing sour grapes. Christians are arrogant when they claim that the followers of other religions are wrongly motivated. Having worked in ministry for more than two decades, I can tell you that I have countless examples of Christian leaders whom I know personally with bad motives. Here are the problems. First of all, we can’t judge 100% what’s in people’s minds, especially people we do not know personally. We’re not God. We can’t play God. Some Christians want to be God’s voice box all the time and it’s totally wrong. Second, we assume (wrongly) that Christians have purer motives than non-Christians. This is the result of having too light view of sins in the Christian. “I’m not perfect, just forgiven” remains a cheap bumper sticker that is devoid of meaning. The new sticker should say, “I’m not perfect, but you’re even more imperfect. I’m forgiven, you’re not nananah …” Well, the new sticker is just too long. Sadly, I’ve been cheated by as many (if not more) Christians as non-Christians. Christians tend to look for a scapegoat for their bad press. News flash! The press doesn’t need to dirty our image. We do it quite well. If we have no dirt, the press has nothing to report. The press is not neutral. No, it is a business of trying to get readers. If it takes a sensational story to get readers, so be it. Over the years, Christians have given the press plenty to report. Readers flock to dirty laundry. I wish the good news we preach would be so newsworthy that the papers will find it appealing. On fourth point above, media bias is just an excuse. If there’re Christians doing enough of the same good deeds, why does the society not know about it? When Jesus talks about bearing fruits, he was not joking about some hidden and secret fruits. He was talking about real and visible good work that everyone would see and praise God for. The problem of that fourth excuse is that Christians do not take what Jesus said about bearing fruits seriously enough. They only bear sour grapes when non-Christians do good work. Sour grapes, I’m sure, was not what Jesus was talking about. The last observation I make here after being a leader of the church for a while is this. Christians do not apply equal criteria on their own good works as they do the works of non-Christians. Imagine someone saying the above four points about Christians. I know some of my readers have already had a raised blood pressure from reading my critique. That just proves my point. Christians love to congratulate and even show off our good work everywhere, on Facebook or TV or internet in general. We also love to pet each other in the back in a holy manner and say, “Praise Jesus” without even stopping to ask about the four criteria. Why are we so hard on non-Christians? Is it because we’re also struggling with our own lack of good work? The above attitude is why non-Christians hate us, and rightly so. What shall we say? Something simple, I suppose. Can we not just be happy that someone like Chow is doing good work and compliment him for it? Can Christians not be happy for the good work of all humankind? Can Christians now moralize over every little thing with a judgmental attitude that speaks loudly of double standard? I hope so. In this New Year, I’m thrilled to find Christians getting caught (unintentionally of course) doing some fantastic deed in the name of Jesus. I especially point to the photo I posted above, first pointed out to me by friend Benson Tsang. 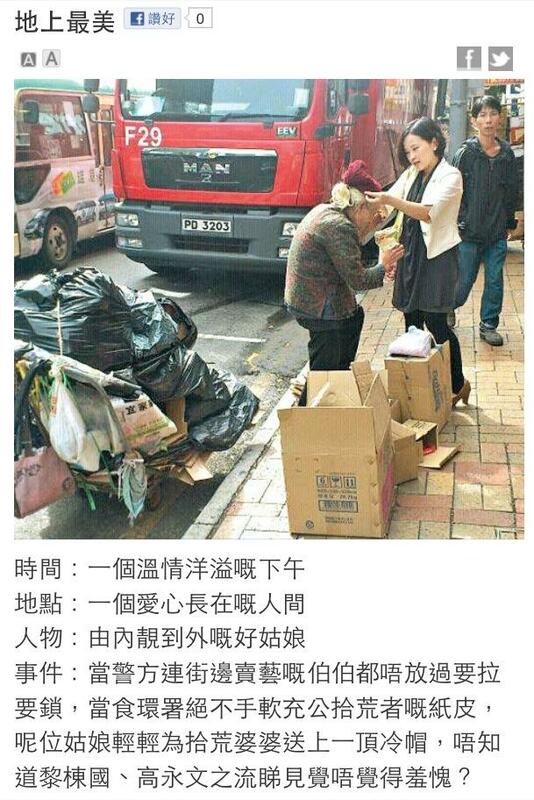 Here, we find my friend, a minister in the church, caught red-handed by the Hong Kong newspaper practicing kindness for the homeless and the poor. I know my friend would be too embarrassed to advertise this news. She has never advertised this work, but here she is, caught doing what she thinks Christ wants her to do. Would we judge her motive? I don’t think we would apply the stringent criteria Christians do with non-Christians, especially when many of us know her personally. I know for a fact that yesterday, this group was helping homeless old ladies while braving a rainstorm (even when the news reporters are no longer around). This is Christianity in action! What acts of kindness will we be caught with this New Year? May your happy New Year be full of such kindness. Being caught doing something great is always better than the opposite.